Even so, downloading android apps to PC from Google Play Store is considered to be a sturdy task and never been a cake-walk. Google has quite a number of stern agreement policies in place to restrict users from downloading apps to any other non-andriod device or computer. Android permits you to download an app’s APK file and install from there itself, but these APKs are generally hosted on third party websites. 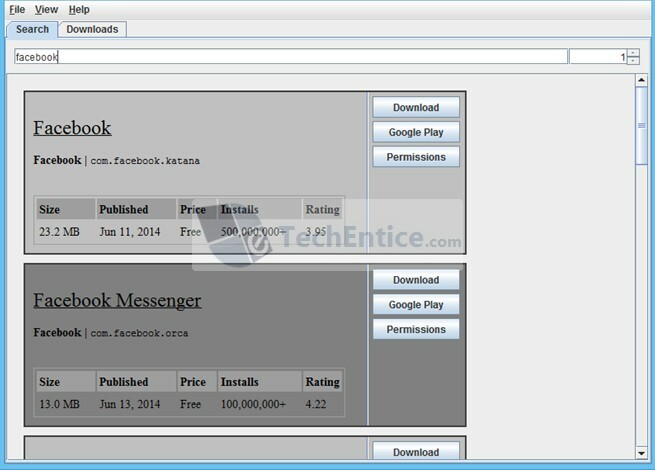 Way back in November 2013, We had reviewed for APK Downloader, a web based offering that permits you to download apps from Google Play to your computer with the help of pointing its URL. Raccoon is a similar application that lets you do the same directly from your desktop. The Java based application demands your Google Account login credentials, and permits you to download all non-payable apps onto your PC without any fuss. After starting off Raccoon, you’re shown with its bare-bones window which displays three input fields at the center of the dialog box: Username, Password and Android ID. You will be required to put in a valid Google Play account and (not mandatory) an Android ID to start up Raccoon and keep it running. If you don’t possess an Android ID you can merely omit out this field blank and Raccoon will automatically make a pseudo ID for you. After signing in, Raccoon will permit you to download any sort of app from Play Store that is linked to your account based on your region. But on the other hand, it won’t allow you to download any paid apps via this interface. To start off, the primary thing you would require is to do is copy the Play Store link of the app that you require to download. For example, if you want to download Facebook’s app, open its Play Store web page, and then copy the web link from the URL bar and paste it in the Search field of Raccoon. Instead, you can also merely type in Facebook and the tool will show you pertinent hints, though the URL option is considered be much more comfortable. After concerning results are populated, Raccoon offers you details about the app’s size, published date, price, and other such details about it, and permits you to open its Google Play page, see Permissions and/or download the APK file. Raccoon downloads every app to the composite file or archive it makes to a folder from where you execute the app. The archive is primarily a download folder that can comprise of numerous editions of downloaded apps and that are capable to automatically update all the comprised apps pertaining to the developer itself. In other words, if you ever require to download APKs from Google Play to your computer, then Raccoon is surely one of the better alternatives that you have for that.